There were rumours of a PlayStation 5 and news on the next generation of Xbox, but this E3 was ultimately pretty light on the cool hardware. We knew that was the case given the sheer amount of VR accessories most of us can’t or won’t use any time soon. These VR shoes were... not one of our favourite things at E3 2018. 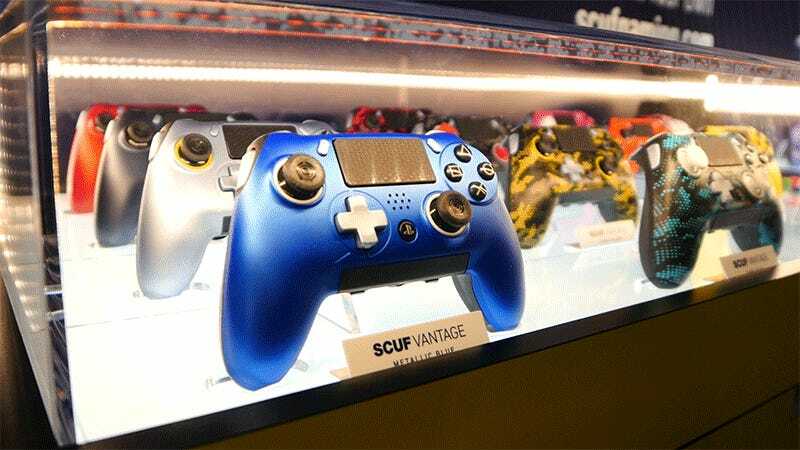 Still, there were some cool controllers, consoles, and weird little accessories at E3 2018. Below are our favourites of the show. Hyperkin’s done a lot of work on the Ultraboy (then called the Ultra Game Boy) since we first went hands on with it at CES 2018 back in January. Nostalgic gamers are going to be clambering to get one, but Hyperkin has actually designed it as the ultimate instrument for Chiptune musicians. As a result, the latest prototypes shown at E3 this year have gained improved audio-out connections, and an oversized volume dial on the side. It can still play classic Game Boy and Game Boy Color games, but don’t expect the Ultraboy to slip into your pocket as easily as your phone does. As if the tiny Nintendo Switch Joy-Con controllers weren’t already quirky enough, for its upcoming games Pokémon: Let’s Go, Pikachu! and Pokémon: Let’s Go, Eevee!, Nintendo’s made a real-life Poké Ball accessory to make players feel more like bonafide Pokémon-ners—is that a real world. Both games can be played using the Switch’s standard controllers, or the Poké Ball Plus which features buttons and a working joystick. 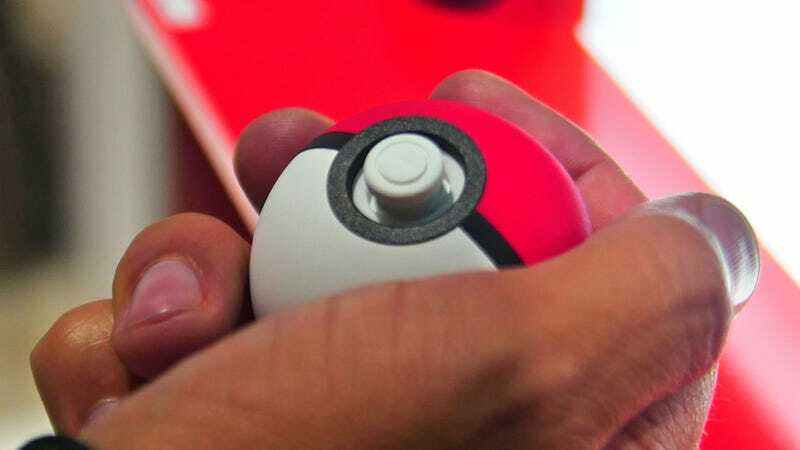 It’s considerably smaller than a real-life Poké Ball would be, and it only lasts for about six hours on a single USB-C charge thanks to the simulated sound effects of the creatures trapped inside, but at $50, or bundled with the games, Nintendo’s going to have no trouble selling these to gamers. Microsoft’s biggest news might have been around a wide range of games it announced, and a tease of the next Xbox, but the adaptive controller, intended for people with disabilities, was a welcome piece of hardware the company showed off after announcing it earlier this month. It has 19 different 3.5mm ports that allow the player to customise the controller for their own needs. It could end up being useful for cheaters, but we love that it’s built for gamers with disabilities first. The first iteration of Hyperkin’s reborn Duke controller is black to closely match the massive controllers that shipped with Microsoft’s original gaming console. After all, that’s the whole point it exists, to put the first Xbox controller back in gamer’s hands, even if they’re using more modern hardware. 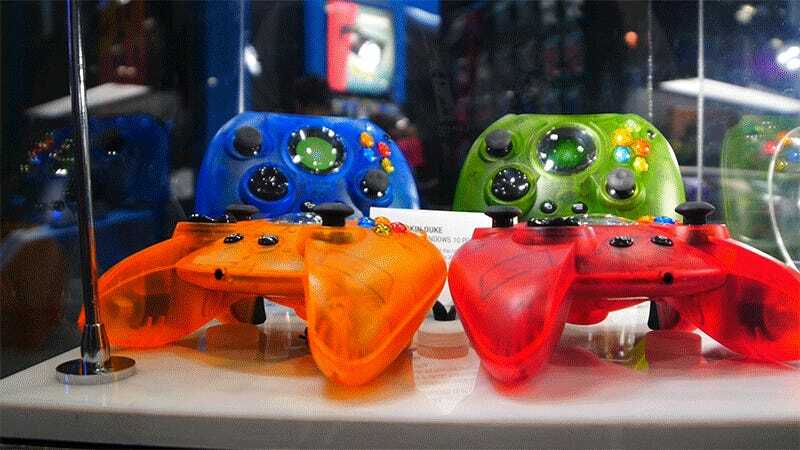 But if you haven’t taken the plunge on the Duke just yet, at E3 Hyperkin revealed four new versions of the imposing controller, finished with orange, red, blue, and green transparent housings to match the action buttons on the controllers themselves. Everything else is exactly the same as the black Duke, however, including that animated LCD screen. 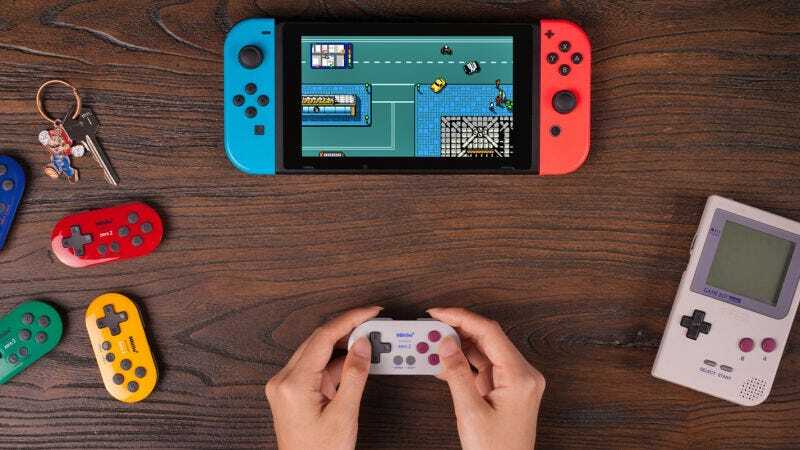 In addition to a corporate rebranding, 8Bitdo revealed a bunch of updates to its wireless controller line at E3 this year, but the standout is version two of its minuscule Zero controller. The Zero 2 carries forward the original’s form factor, you can still easily hang it on a keychain, but it adds motion controls, and compatibility with the Switch, and all at an equally tiny $20 [ £15] price point.